This article is about keeping alive in you always the flame of the life of God in your soul, that you may make progress on the journey to union with God, and go to heaven. Recently I substitute-taught second grade catechism at Holy Redeemer Church. I got excited when I saw the textbook title: Creemos: Jesus Comparte la Vida de Dios/We Believe: Jesus Shares God’s Life. It’s bilingual–important at this parish! But I was excited by what it says: second graders are being taught about sanctifying grace, the life of God in us, imparted at Baptism, made strong in Confirmation, fed in the Eucharist, restored when it had been driven out of us by sin, in Reconciliation. I was not taught that when I was a Catholic young girl, and how I wish I had been told! But the state of catechesis has been for many years very, very bad and is just now getting better. In fact a few years ago Pope Benedict XVI formally asked forgiveness for generations of “cradle Catholics” who failed to transmit the Faith to others. I want to try to tell you about the life of grace: the essential Catholic Christian knowledge someone should have taught you and me when we were Catholic kids in second grade and then further developed our understanding of as we matured. Before you were in Christ and a child of God through baptism, you were simply a descendent of Adam, and together with all the human race you shared in the original sin which Eve and Adam committed. Satan dwells in the unbaptized person. 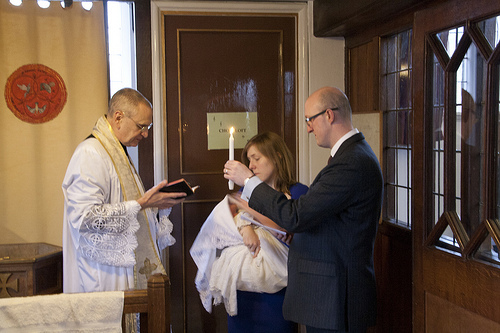 A new dad holds a baptismal candle for his baby newly born in Christ from the waters of Baptism, while a priest of the Fraternity of St Peter celebrates the traditional rites. When you were Baptized, Satan was cast out. Every sin was wiped away as you entered into the dying and rising of Jesus. 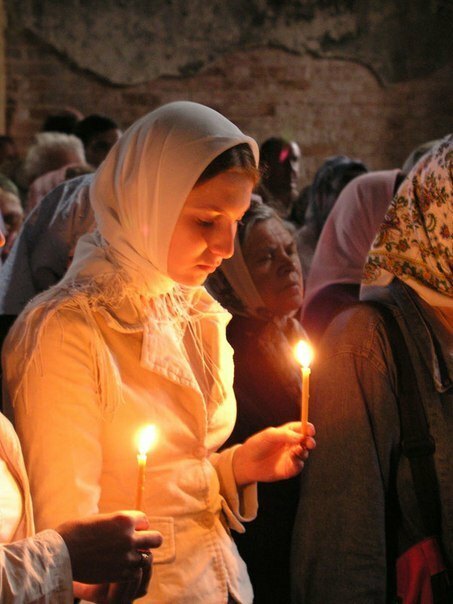 You entered the Church as through a door, became a son or daughter of God, and the Holy Spirit came into your heart, the gift of God Himself, sanctifying Grace. Like a flame, the Life of God was kindled in you for the first time. The Sacrament of Confirmation made the flame of the divine Life strong in you. As the apostles were at Pentecost, you were anointed with all the gifts of the Holy Spirit that you may be truly Jesus’ disciple and witness. To be confirmed validly you cannot be under any canonical censure such as excommunication. 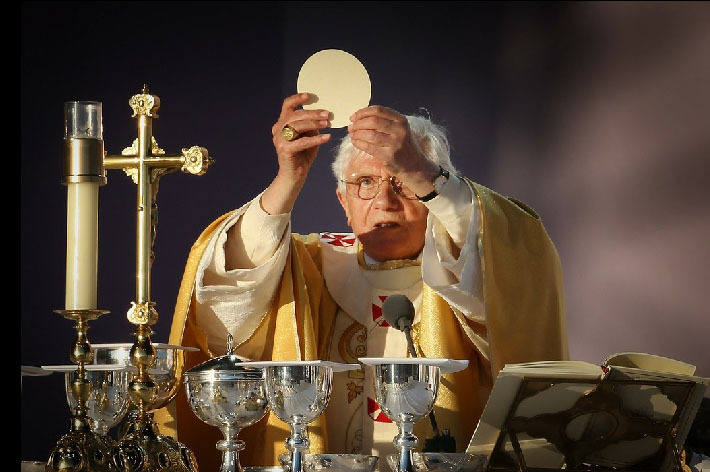 The Eucharist in the sense of the Holy Mass is the re-presentation of the one saving Sacrifice of Jesus at Calvary and is the source and summit of the Christian life. The Eucharist in the sense of the Blessed Sacrament is Jesus present Body, Blood Soul and Divinity under the appearances of bread and wine. The Eucharist is food for the journey, but unlike natural food that becomes part of our body, the Eucharist incorporates us into the Body of Christ. Incomprehensibly precious, and we should love the Holy Mass and go often, and make time for prayer before the Blessed Sacrament. It is the Lord! We should approach to receive Holy Communion only if we are in the state of grace, and this greatest Sacrament is able to remit venial sin, uniting us far more closely to God. Your soul is like a milk bottle? Is this the best and most dignified way to explain it? I doubt it. But I laughed, and it is simple to understand. The image of sanctifying Grace as a flame kindled in the heart and that we must not quench by sin but keep alive as more precious to us than anything else, is far more apt, scriptural and traditional. “A bruised reed He does not break; a smoldering wick He does not quench.” God is faithful! His love Has pursued you, far more than you have sought Him! He would NEVER withdraw the life of grace from a baptized person, though we have freedom to expel that divine life. By free will it is possible to truly love but also to choose contrary to love and sever friendship with God, committing mortal sin, that is, sin that is grave matter AND done with full knowledge AND free consent of the will. A person who dies in mortal sin has definitively chosen their sin rather than loving God, they have chosen eternity in hell–this mortal, temporal life is the time for repentance and mercy, and after death we can no longer repent, nor merit or demerit. Every person who dies with the flame of sanctifying grace alive in them is saved and will see God in heaven, though some will experience a period of simultaneously painful and joyful purification in Purgatory before they are able (it is far better to be purified in this life). Every person is gravely responsible for forming their conscience in accord with the truth, truth which (we have a truly massive advantage as Catholics) is taught infallibly by the Catholic Church; it’s not true what some people erroneously think Vatican II taught, that “it’s never a sin as long as I’m following my conscience”. Normally you can choose whether to confess with a screen or face to face with the priest, though some priests always use a screen. 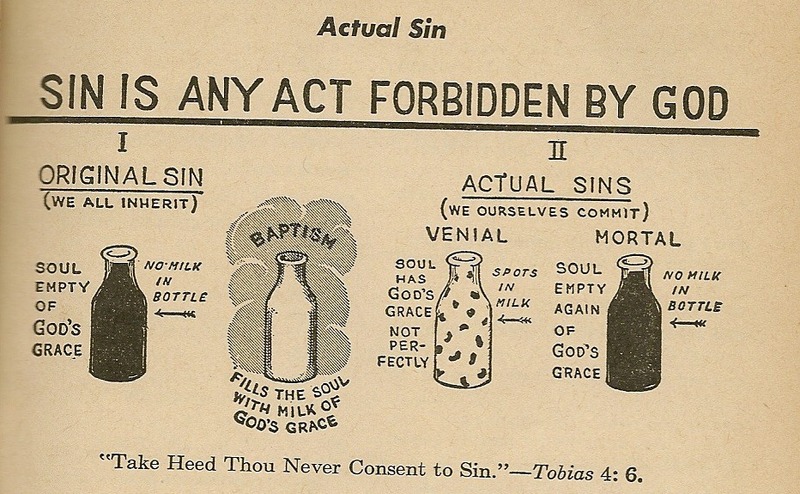 Beforehand, examine your conscience, using the 10 commandments, 7 deadly sins, and precepts of the Church as a guide. In the confessional, make the sign of the Cross and say “Bless me Father, for I have sinned. It has been X period of time since my last confession.” He will pray for you and then you state your sins straightforwardly, with the most serious ones first. Mortal sins must be stated in kind and number, and without omitting any mortal sin that you remember. Then you can state some venial sins, optionally, if you want to. The priest may ask further questions so as to understand, and may offer guidance. He will assign a penance which you must remember, and ask you to make an act of contrition, which you should have memorized but if you forget then express sincerely to God in your own words you are sorry, sad for your sins, intend with His help to sin no more and avoid everything that leads to sin. The priest will say the words of absolution and you will make the sign of the Cross. He will say something like “Go in peace.” You may thank him or thank God or (very appropriate) both. I’m praying for you! It is possible after baptism to remain in the state of grace all through life, and at least a few of the Saints have done so, most famously St Aloysius Gonzaga and St Therese of Lisieux. But even they made frequent use of the Sacrament of Penance, which most importantly restores the flame of sanctifying grace in a soul that lost it by mortal sin, but is also very grace-giving and healing for souls who have committed less serious sins, and helps us to avoid falling into sin. Regular confession, and if possible going to Mass more often than just on Sundays, is an immense help for remaining in the state of grace. 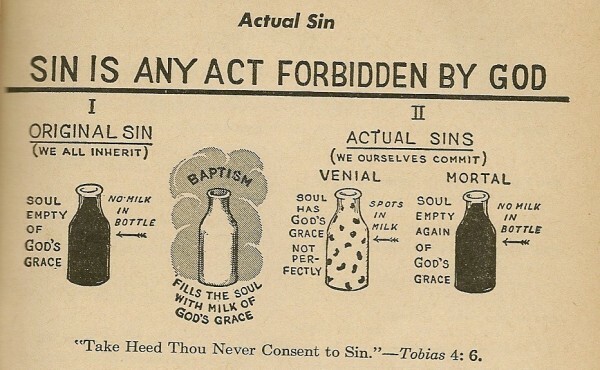 For absolution to be given, at least some venial sin must be confessed, but if the person has sinned mortally they must confess every grave sin they are aware of in kind and number. At the end of life, a great help is the Sacrament of Anointing of the Sick. This sacrament always gives grace to the person in danger of death, or simply in declining health or old age. 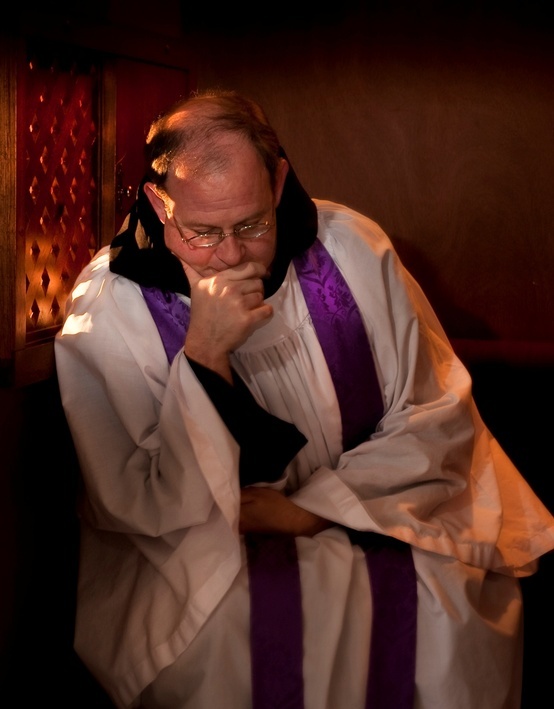 For a person who is beyond the possibility of making a confession, it can also forgive their mortal sins. 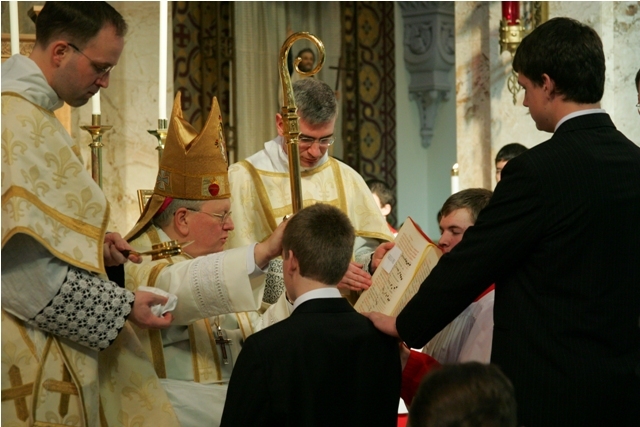 And even a baptized non Catholic can receive this Sacrament from a Catholic priest if they are in danger of dying. There’s some further knowledge Catholics need, to know the basic minimum of religious practice to remain a practicing Catholic in good standing: the Precepts of the Church. I. To attend Mass every Sundays and Holy Day of Obligation unless a grave reason prevents it, and resting from servile work on these days. V. To contribute to the support of the Church and her pastors. After I taught those second graders about the flame of the Holy Spirit living in their hearts since Baptism, and what an incomparable and wonderful gift it is, and how it helps them to be good and kind and wise and and brave to stand up for their Catholic beliefs, I asked them to raise their hands if they wanted that flame to stay alive all the rest of their life long. And all dozen or so raised their hands! Well there was just one boy, perhaps already with some self-knowledge, who hesitated a bit before he too raised his hand! May he, by the grace of God, become the greatest saint among them. I was really inspired by those children, loved them a lot and have prayed that they may hold fast in such good desires while they grow in understanding. We are all called to holiness. And the beginner level of growth in holiness is getting in the state of grace and remaining there. That’s also of course, the way to be always ready to go to heaven, since we know neither the day nor the hour when we might be called. But someone who is falling in and out of the state of grace is getting nowhere in their spiritual life, not yet dwelling stably in the “first mansion” of St Teresa of Avila’s 7-tiered vision of the journey to union with God in The Interior Castle, one of the greatest of books on prayer and spiritual growth. Pray every day and God will not fail to help you. I promise my prayers for everyone who reads this, and you pray for me, too. Keep the flame of Sanctifying Grace alive in you, always! 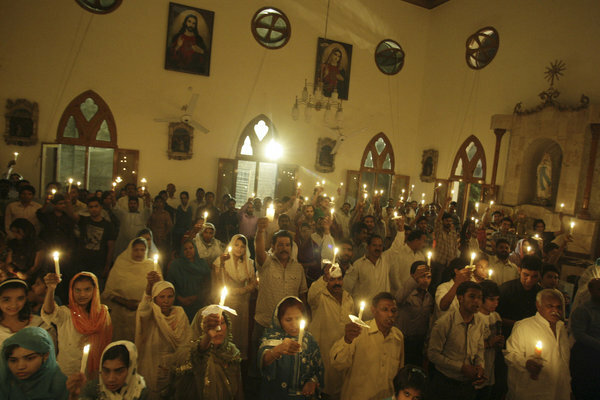 Catholics with candles lit from the Easter Candle, representing the life of grace given at Baptism, at the start of Easter Vigil Mass in Lahore Pakistan. We do the very same in Madison, of course! What a lovely article! Thank you so much for sharing this! I am praying for you and thank you for praying for me!